Vegas Hero is another fantastic product from Genesis Global. The site began operating in November 2017 and has pledged to provide its players with an exceptional online casino experience. Vegas Hero has a library of more than 1,300 games developed by some of the most respected developers in the industry. This includes Microgaming, NetEnt, Play'n GO, NYX Interactive, Evolution Gaming and Quickspin. The site gives its players a wide choice of games to enjoy, but it does not skimp on quality. Vegas Hero offers mega jackpots, table games, video slots and live casino games, giving players of all skill levels the opportunity to find something suitable for them. Vegas Hero has designed its site with fluid scalability, so you can have the same high-quality experience whether you use a desktop, laptop, tablet or other mobile devices. The site also offers an app for smartphones that can store up to 300 of the games that you enjoy the most. Just like when you access Vegas Hero on your desktop, you have the choice of English, German, Finnish, Norwegian, Swedish or Arabic versions of the site. Vegas Hero is regulated and licensed by the UK Gambling Commission and the Malta Gaming Authority. Residents of Denmark, Iran, Israel, Portugal, Romania, Spain, Turkey and the US are not authorised to open an account on the site. 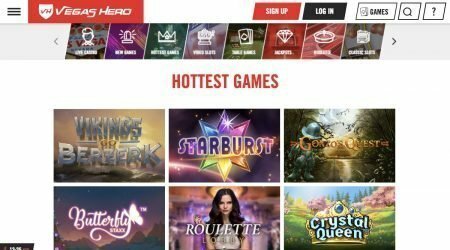 Vegas Hero offers new players a welcome bonus and also offers both new and long-term players a variety of other incentives to use the site. Vegas Hero offers new players a welcome bonus that it calls a Welcome Power Pack. The Welcome Power Pack provides you with a matching deposit bonus on your first four deposits. The percentage match for each of the four deposits varies. For your first deposit, you will receive a 100% match for up to 200 GBP and 50 free spins. For your second deposit, you will receive a 50% match for up to 200 GBP. For your third and fourth deposits, you will receive a 25% match for up to 300 GBP for each deposit. Vegas Hero sets a minimum 40 times wagering requirement on bonuses, and it locks the bonus deposit to the casino platform until you meet the wagering requirement. For example, if you make an initial deposit of £100, then you must wager £4,000 before you can withdraw your bonus. You can only use the 50 free spins that come with your first Welcome Power Pack deposit bonus on certain games: Stickers, Sparks, Neon Staxx, Glow and Dazzle Me. You cannot use all the 50 free spins on the same day. Your free spins are limited to ten spins a day for five consecutive days. Vegas Hero also offers a Power Play deposit bonus on Tuesdays for all players. You will receive a 25% match for a deposit up to 100 GBP. 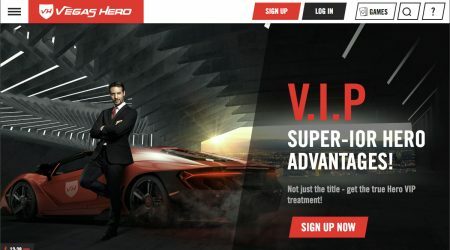 In addition, Vegas Hero offers a VIP programme for heavy users of the site. Benefits of the VIP programme include exclusive bonuses and free spins, a monthly VIP prize drawing, a dedicated account manager, personalised birthday bonuses, and holiday packages, including flights to Las Vegas. 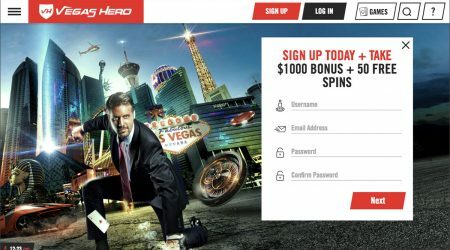 The games on the Vegas Hero site are divided into seven categories: live casino, new games, video slots, table games, roulette, jackpots and online slots. In addition, a category called new games showcases some of the games from each category. Overall, there are over 1,300 games from which to choose, which is one of the highest amounts available on online casino sites. One of the best features available on the site is the ability of players to try each and every game for free before they must make a deposit. Each game comes with a “Try” button, making it easy for players to explore the site and find the games that are suitable for them. The variety of slots available at Vegas Hero is outstanding. You are sure to find some of your favourite slot games among the site’s collection, including some of the branded slots that are in high demand at land-based casinos. Among the slot games available are Butterfly Staxx, Viking Runecraft, Gonzo’s Quest, Jurassic World, Sails of Gold, Hugo, Super Lucky Frog, The Phantom of the Opera, Fruit Bonanza, Finn and the Swirly Spin, Jungle Spirit: Call of the Wild, Aloha! Cluster Pays, Scruffy Duck, Crystal Queen, Immortal Romance, Fu Er Dai, King Tusk, Big Win Cat, Humpty Dumpty Wild Riches and Empress of the Jade Sword. Vegas Hero provides an outstanding collection of live casino games. The live casino features games that stream an HD video feed of real dealers and real tables directly to your desktop or other computer devices. Using a live chat box, you can interact with the dealer in the same way that you would in a land-based casino, and the dealers will give you answers to your questions in real time. Vegas Hero gives you a choice of about 50 live casino games with a broad range of bet denominations. You can choose from multiple versions of roulette, baccarat, blackjack, Three Card Poker and Texas hold’em. Titles available include Live Roulette VIP, Live Roulette Lobby, Live Exclusive Blackjack, Live Blackjack Lobby, Live Dream Catcher, Live Dealer Roulette VIP, Live High Roller Roulette, Live Texas Hold’em Ultimate, Live Stud Poker Lobby, Live Blackjack, Live High-Roller Comm. Draw BJ, Live BJ High Roller Standard Pro, Live BJ High Roller Standard, Live Immersive Roulette, Live Dealer German Roulette, Live Dealer Roulette Standard and Live Dealer Roulette Promotion. 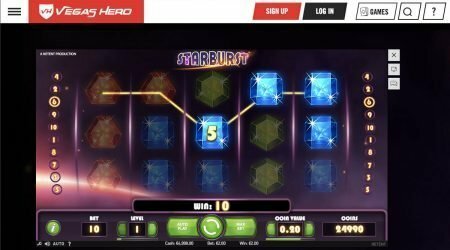 Besides the huge selection of live casino games available, Vegas Hero also has an excellent collection of computerised table games. Most likely, you’ll find any table that you enjoy in the site’s offering, and there may even be some variations of the table games that you haven’t played before. Having a choice of new games to try is always exciting, and this gives you another reason to check out Vegas Hero. Titles available include Single Deck Blackjack, Vegas Strip Blackjack Gold, European Blackjack Redeal Gold, Blackjack Game, Casino Hold’em, Casino Stud Poker, Beat Me, Pai Gow Poker, Cyber Stud Poker, Spanish 21 Blackjack Gold, Mini Baccarat, European Blackjack MH, Single Deck Blackjack MH, Super Fun 21, Poker Pursuit, High Limit European Blackjack, High Limit Baccarat, Baccarat Game, Vegas Single Deck Blackjack Gold, Triple Pocket Hold’em Poker, Multi-Hand Vegas BJ, Multi-Hand European BJ Gold, Hi-Lo 13 European Blackjack Gold, Double Exposure Blackjack Gold, Big 5 Blackjack Gold, Baccarat Gold, Atlantic City Blackjack Gold, Premier Multi-Hand Euro Bonus Blackjack Gold, Premier BJ High Streak Gold, Punto Banco, Texas Hold’em, Oasis Poker, Progress Red Dog, Pontoon Professional Series and Double Exposure Blackjack. Vegas Hero offers several options for making deposits and withdrawals, and the site does not charge its players any fees for making deposits or withdrawals. Vegas Hero offers six methods for players to make deposits: Visa, Mastercard, Maestro, Entropay, paysafecard, Neteller, Skrill and ecoPayz. Processing times are instant for all deposit methods, so you can start playing immediately once you make your deposit. For all methods, the minimum deposit is £10 and the maximum is £5,000. When it comes to withdrawals, Vegas Hero offers fewer options – Visa, Mastercard, Neteller, Skrill, ecoPayz and online bank transfer. Processing times are instant for Neteller, Skrill and ecoPayz. Processing for Visa and Mastercard will take from one to three business days, while processing times for online bank transfers will take from three to five business days. For all methods, the minimum withdrawal is £10 and the maximum is £2,300. Vegas Hero accepts deposits in 26 currencies, but once you choose a currency to fund your account, you cannot change it. Residents of the UK can only fund their account using GBP. Vegas Hero makes it easy to get customer support when you need it. Simply click on the question mark in the top right-hand corner of the site’s homepage to obtain a list of options for getting in touch with the customer support team. Customer support is available 24 hours a day, seven days a week. You may contact them via phone, email or the site’s live chat function. Customers have found that the customer service team has been available to provide assistance when needed and was courteous and helpful. For a relatively new online casino, Vegas Hero exceeds expectations. The site offers a huge selection of games that will provide something suitable for players with all levels of experience with online casinos. The live casino games provide the look and feel of a brick-and-mortar casino. The site offers excellent bonus offers, and the software is fast and smooth, with no need to download anything to play the myriad of games on the site. The ability to “test drive” the games before risking any money is a real plus. Vegas Hero also offers a robust selection of payment and withdrawal options that make the site suitable for players from throughout the world. This site is highly recommended.